With its lavish Beaux Arts architecture and magnificent interior of wood-panelling and crystal chandeliers, the Château Bouffémont is a 19th century jewel in the heart of the verdant Val-d’Oise. 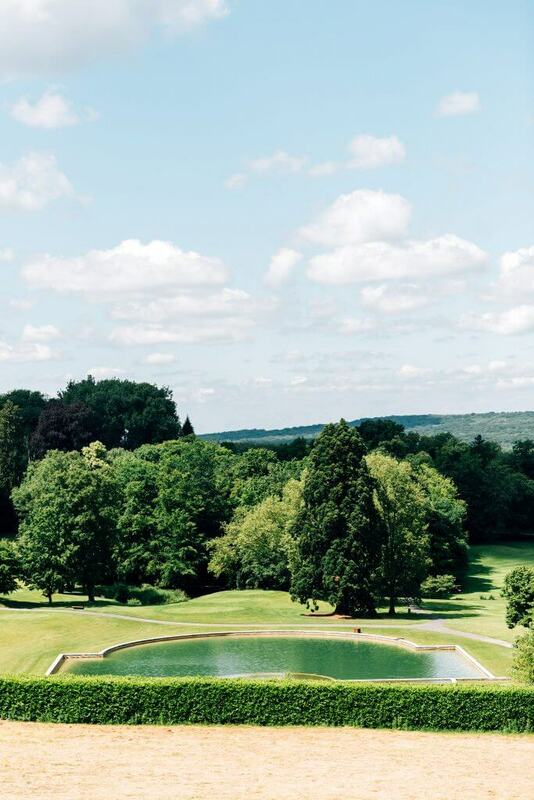 Beyond the Château’s own five hectares of split-level gardens guests can enjoy striking views of the ancient forest of Montmorency – our grounds are perched right on the edge of the woods, in perfect fairy tale style. Here we take a journey into the forest to discover all the magic that Montmorency has to offer. A trip to the City of Lights will never be solely about immersing oneself in the artistic treasures of the Louvre, marvelling at the intricate Gothic detailing or flying buttresses of Notre-Dame Cathedral, or even revelling in sumptuous interiors during your downtimes in the prestigious chateau. That’s because, with its distinguished history stretching back to the third century BC, as well as the ease with which it can be explored on foot, Paris will always serve up fresh and undiscovered delights to the sufficiently curious visitor. Here, then, are just a few of the unsung Parisian landmarks that are well worth incorporating into your itinerary during your time in this incomparable art, historical and fashion capital. As outlined in this Architectural Digest article, you will find what is reputed to be the oldest stone house in the city at 51 rue de Montmorency in the 3rd arrondissement. It was built in 1407 by the alchemist and manuscript seller who was also its most famous occupant, Nicolas Flamel, and it is even rumoured that he carried out experiments here. The building underwent restoration in 1900, and its ground-floor space is now the Auberge Nicolas Flamel Restaurant. This Marais property was once thought to be the city’s oldest house, its architecture having suggested to many observers that it may have been built in the 14th century. In 1979, however, as detailed by the Travel France Online site, archaeologists found documents dating the property to 1644. The house is therefore now thought to have been constructed specifically to resemble a medieval design, and it’s fair to say that it continues to inspire great affection among the French, and is absolutely worth the detour. There aren’t many more unusual architectural sights in Paris than what has been declared the city’s smallest building, wedged between two 10th arrondissement buildings and constructed to resolve a property dispute. Measuring a mere 3.3 feet wide and 16.4 feet tall, the structure was initially a shoemaker’s studio incorporating an upstairs live-in studio, but has since become an apartment. While there is no shortage of buildings in Paris that have a rich association with fine art, there are surely few with a stronger and more intriguing heritage in this regard than the Galerie Nationale de Jeu de Paume. The rectangular structure housing the museum can be found near the Place de la Concorde, in the northern corner of the Tuileries Gardens, and was constructed in 1861, during the reign of Napoleon III. At first, it housed real tennis courts, but between 1940 and 1944, it stored Nazi plunder, including masterpieces from the collections of French Jewish families. From 1947 to 1986, it served as a museum of impressionist art prior to the opening of the Musée d’Orsay, and in more recent years, it has been a gallery of modern and postmodern photography and media. If you are a Canadian, British or other English-speaking visitor and consider yourself a bibliophile, there could surely be a no finer destination in Paris than the Abbey Bookshop, which has been a fixture of the Latin Quarter since it was opened by Brian Spence in 1989. While the more than 35,000 books piled to the ceilings are certainly a major attraction – with many not exactly the kind of tomes you can find on Amazon – the handsome building in which it is based, the 18th-century Hotel Dubuisson, is scarcely any less a draw. As you can see, there are many more historical charms to be encountered in Paris than the Eiffel Tower or the Arc de Triomphe! Don’t forget, too, that you can even rest your head overnight in a building of rich heritage in its own right, in the form of the fairytale French chateau near Paris, Château Bouffémont. 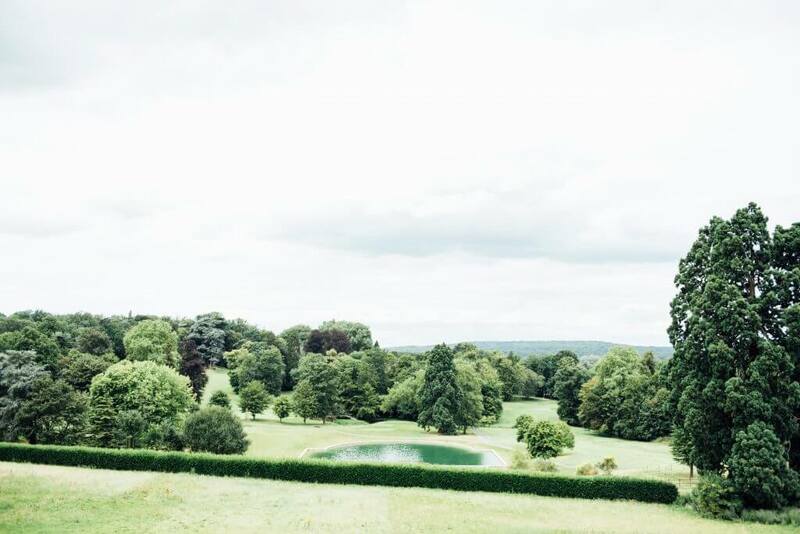 If you are even contemplating staying overnight or holding an event at a French chateau, you will naturally wish to choose a property that draws the eye and woos every person who sees it. It is customary for many a French chateau to be set in spectacular manicured grounds. However, even by those standards, the five acres of verdant greenery surrounding Château Bouffémont have to be seen to be believed. After all, there aren’t too many French chateaus that can offer such jaw-dropping gardens as ours over not just one, or even two, but three levels, exuding the French classicism that informed the entire design of our estate. Where is the finest spot from which to survey the entirety of the estate during your short time as lord of the manor at Château Bouffémont? That may come down to individual taste, but the noble stone-built property’s 120-square-metre terrace certainly affords quite the place to relax with your favourite tipple as you gaze across our extensive gardens and contemplate how to idle the day away. If the sight of the outside of our fairytale venue would already seem to leave you spellbound enough, you simply have to see how the magic continues inside. Such tasteful, historically sensitive touches as crystal chandeliers, authentic wood panelling and fine fabrics across prestigious spaces like the Dandy Lounge, Grand Salon and Salon des Anges serve as a testament to the remarkable skills and judgement of the Italian architects, Augusto Busnelli and Marco Allievi. Château Bouffémont comprises nine prestigious suites and rooms that are capable of accommodating as many as 27 guests. These beautifully furnished spaces also demonstrate how adept our venue is at blending aristocratic charm with modern comforts such as flat-screen televisions, radios, telephones, the Internet and Wi-Fi. One could scarcely choose a more desirable setting for a French chateau than the Montmorency Forest. As the website of the suburban railway service SNCF Transilien explains, this natural area is an invaluable green lung of the Val d’Oise region, 90% of its surface being covered in sweet chestnut trees. It is also an excellent playground for the more active type, with such activities as walking, mountain biking and horse riding all taking place here. It is also from here that the visitor can easily reach the cosmopolitan delights of Paris, which is situated a mere 30 kilometres from the French chateau. Many of the world’s most renowned art galleries, museums, historical sites, theatres, restaurants and cafes await your discovery in the French capital. So if you have day trips in mind, why not read the Paris tourist office’s own advice about the many great things to see and do in the city? Such ingredients as the above all show that Château Bouffémont can be depended on to take the breath away of everyone who encounters this sought-after former residence of the Marquise of Preignes and Baron Empain. Contact us today, and you will soon be able to experience it for yourself. 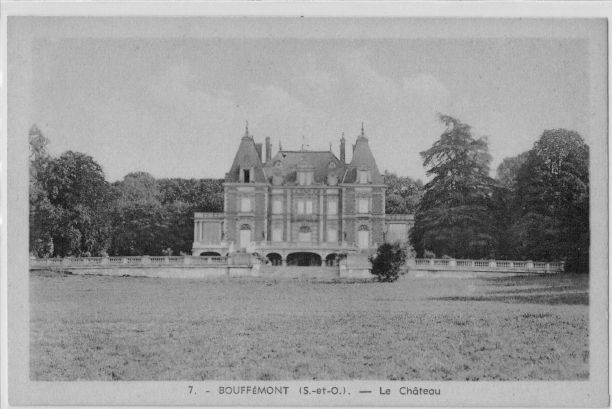 The Château Bouffémont was built during the reign of Napoleon III (in 1860) by the Vallée family. After a short period when it belonged to the marquise de Preignes, it was permanently acquired by the Empain family, through the major general baron Empain. Edouard Louis Joseph Empain comes from a family of five siblings (three girls and two boys) and spends his childhood in Belgium. General and aide-de-camp of King Leopold, he is knighted by the king in 1907. He founds a company that will become an industrial empire: the Compagnie du Chemin de Fer métropolitain de Paris built and exploited Paris railroads, among others, until 1945. 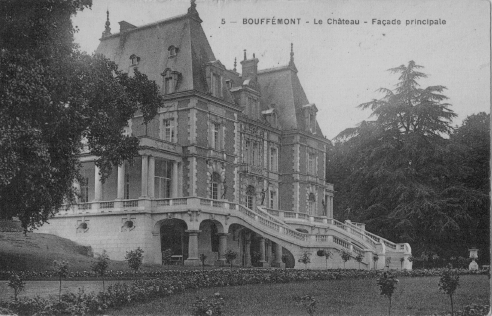 Following Edouard Empain’s death just after World War II, in 1946, his wife takes over the Château’s management. Nearly three generations of Empain will live there for over half a century. Similarly to the residences of the nobility of the era, the Château includes large annexes stretching over a 250-hectare domain, at the heart of the Montmorency forest. The inhabitants of Bouffémont are involved in the Château’s activity and provide the manual labour and farm work for the Empain family. Involved in the welfare and prosperity of the village community, the Château was the setting of the traditional award ceremony for schoolchildren. Located in the Oise department, 30 km (18.5 miles) from Paris, at the edge of the Montmorency forest, the Château is now a private residence, fully dedicated to rental. 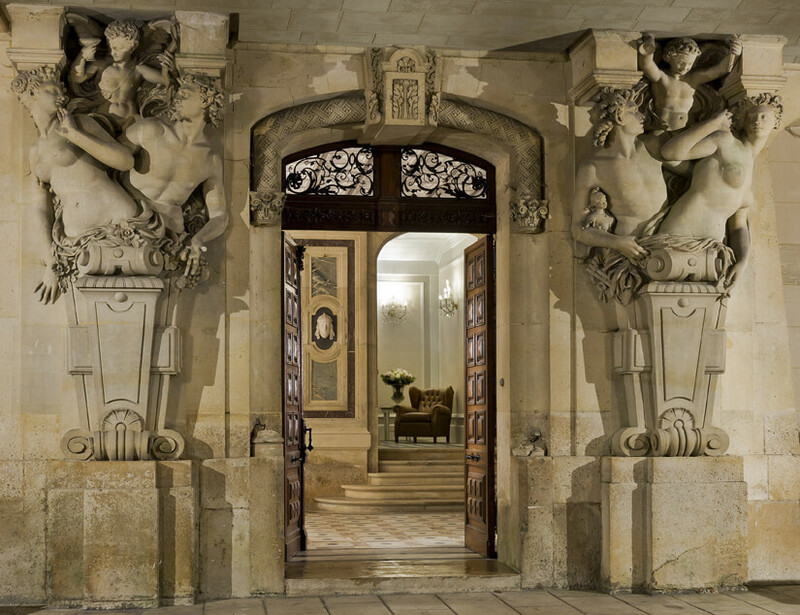 Boasting an architecture and Louis XIII style furniture, the Belle Epoque has left its mark on the Château.